As electronification expands the world over, buy-side firms invest in trading infrastructure. Boston, April 23, 2014 – Electronic trading has moved from mere curiosity to basic competitive requirement, and major buy-side firms globally have adopted order management systems and execution management systems in droves. The smooth workflow these systems afford brings enormous benefits to a well-oiled investment management operation, while poorly integrated, outdated OMSs and EMSs can become a major time and resource drain. But are firms interested in an upgrade, or are they just fine with the status quo? 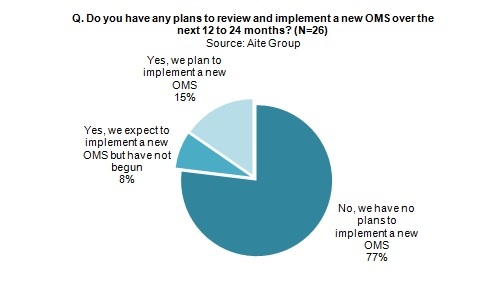 Based on an April to September 2013 Aite Group survey of 26 buy-side firms, this Impact Note takes the perspective of actual OMS and EMS buy-side end users and provides insights into how these platforms are being leveraged, end users' general perceptions on the quality of these systems, and important factors leading to end users' upcoming decisions for system overhauls or replacements. This 30-page Impact Note contains 25 figures. Clients of Aite Group's Institutional Securities & Investments service can download this report.